Joanna Burt (Métis/Saugeen Ojibway), Everett Morrison (Cree), Billy Merasty (Cree), Elisapie Isaac (Inuit) and Wadohandik Gros-Louis (Huron-Wendat). Photo by Marie White. Fifty years after the original opera by Harry Somers and Mavor Moore, Peter Hinton has directed a revisited version of Louis Riel, which included Native performers for the first time. It is the result of a major national co-production by the Canadian Opera Company and the National Arts Centre about the Métis leader. It was commissioned for the 150 anniversary of Confederation. It premiered in Toronto on April 20 went to Ottawa on June 15 and was in Quebec City on July 30 and again Aug. 3. In Quebec City, the curtain rose on Huron-Wendat Steeve Wadohandik Gros-Louis. He spoke about his nation’s history and traditions of the Huron-Wendat that he learned from his Elders. The community is striving to revive the original language through the Yawenda Project. Founder of the Sandokwa dance group, owner of the Sagamité restaurant, and president of Quebec Aboriginal Tourism, Gros-Louis thanked Grégoire Legendre, general and artistic director of the Opéra de Québec, for honouring his nation in this landmark production. A four-language opera, Hinton selected Cree and Michif (subtitles) to accompany English and French and sought renowned Indigenous artists from across the land to authentically render Native voices and cultures. Billy Merasty, Joanna Burt, Everett Morrison, Elisapie Isaac and Steeve Wadohandik Gros-Louis enriched the production, like cultural ambassadors, with their Cree, Métis/Ojibwe, Inuit and Huron-Wendat talent. The Native presence happened also through the Land Assembly Chorus, the collective conscience in the opera.. Most of all though, it was the inclusion of Cree and Michif in the production that was a remarkable initiative. Russell Braun led the cast as Louis Riel and sang principally in English, then French and some Michif. There is a particularly uplifting Métis moment when the Land Assembly Chorus clapped as Elisapie Isaac sang in Michif for the Bison Dance. Windspeaker.com reached Manitoba Métis Elder Norman Fleury, who did Métis translations for the musical drama, at his home in Saskatoon. 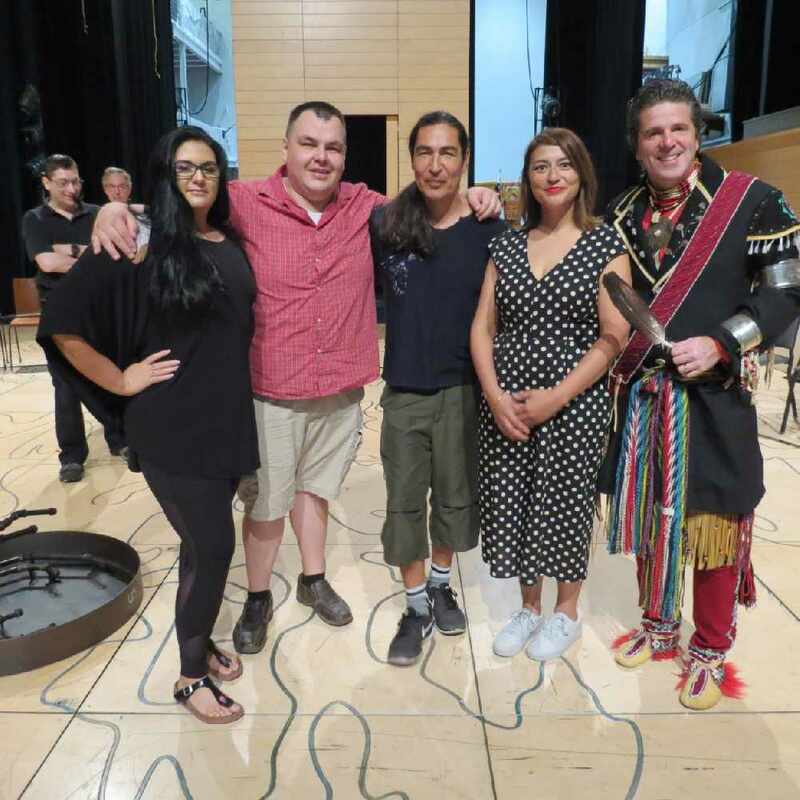 “It was a pleasure doing the translations because I was transmitting the Michif language,” said Fleury, “and the opera dramatizes our stories and history, which can help everyone to know who the Métis are. “And it’s about asserting our rights, which is still an issue today. Canada needs to recognize the Métis.” According to this Michif expert who teaches it at the University of Saskatchewan, there is an increasing interest in learning Michif. “People are seeking to know the language to have a better sense of their identity because without a sense of identity, you don’t feel good about yourself.” Fleury believed it was likely the first time that Michif was featured in such a major national artistic production. Michif had been an entirely oral language until recently. Since the language has not been standardized, there are different forms of Michif in the different Métis communities. But Fleury, keen to preserve and promote it, and inspired by a world-first 1980s Michif dictionary produced in North Dakota, decided to collect his knowledge into the first ever Canadian Michif dictionary in 2013, La Laang Michif Piikishkwaywin. His dictionary is a major linguistic step in protecting and transmitting this endangered language. He has also developed online material and a Michif app. Michif carries the components of French culture and heritage, as well as First Nations heritage, cultural knowledge and the development of the country. “The nouns are French with associated grammar, the verbs are Cree with associated grammar and there are borrowings from English,” explained Fleury based on Peter Bakker’s PhD research. “I was overwhelmed to see the opera company so well organized and everyone showing so much interest,” said Fleury, who worked in Toronto on the Michif text and saw the performance in Ottawa. Fleury feels that the Louis Riel story has evolved greatly since he was young. As for the opera’s Cree text, it was translated by accomplished Cree actor, singer and playwright Billy Merasty, who has more than 34 years of professional experience. Merasty is well-known for his acting roles, such as in Elijah (Elijah Harper), Moose TV and for Quebec’s renowned Robert Lepage, as well as his playwright work leading the Indigenous storytelling event at Toronto’s Congress 2017 last May. Nephew to playwright Thomson Highway and dancer René Highway, he received the Order of Manitoba in 2010 (Order of the Buffalo Hunt) as an Aboriginal role model. Maresty, like Fleury, is concerned about the future of his language. Initially invited to be the Cree diction coach, Métis/Ojibwe singer Joanna Burt was later offered a lead role as Riel’s sister, a first for an Indigenous artist in a COC production. Another professional first came for Inuit singer and documentary filmmaker Elisapie Isaac, 40, making her debut to the opera scene. A Six Nations of the Grand River choreographer, Tekaronhiahkhwa Santee Smith, was also part of the production. World-renowned linguist David Crystal strongly suggests using endangered languages in artistic oral productions as powerful ways to preserve, protect and promote them. This may inspire other artists—like the famous Canadian playwright Robert Lepage who attended the Quebec premiere—to also include Native languages in their artistic productions. As such, Louis Riel may well prove to be not just a timely tale of Indigenous struggle in the Truth and Reconciliation period, but hopefully, also a valuable influence on the life and longevity of Native languages.